Met with four more members of the Board of Advisors. Sent notes to Board of Directors. Next week I’ll write it up for the Board of Advisors and the GNOME Foundation. I believe their feedback is some good stuff for discussion at GUADEC. Sent out a mail to some of the team leads (like travel, sys admin, etc) to talk about how we can standardize on reporting. Early consensus is to have standard documents and reporting times and places. Got press contacts from advisory board members and Desktop Summit sponsors for the press at the Desktop Summit. Pinged on the status for a couple of the sponsored parties at the Desktop Summit. Gave input on agendas for board of advisors, board of directors and AGM meetings at GUADEC. Was very excited about all the progress Paul Cutler and the marketing team have made on mission, goals, wiki pages, etc. Contributed a few ideas to a couple of pages. Exchanged email with someone who put in a bid to host this year’s GNOME.Asia summit. Talked to TI who is donating some Zoom 2‘s to the GNOME usability team. Sent 401K plan guy’s answers back to our attorneys for another round of review. Answer some interview questions for an article around Desktop Summit. Write another invitation letter for a Desktop Summit/GUADEC attendee who needs it for visa/work reasons. Send out agenda for advisory board meeting at GUADEC. Make sure sponsored Desktop Summit and GUADEC parties happen. This was a crazy week with a ton of meetings but I asked for it! I set up one on one (phone) meetings with (almost) all the advisory board members. I wanted to talk about their GUADEC plans, what they’d like to see at GUADEC (especially with regards to the advisory board meeting) and to get their feedback about how things have gone with the Foundation in the past year. Met with 15 of the advisory board representatives this week representing 12 companies. (Got stood up a few times too.) Have five companies that I didn’t meet with – two are not being responsive, the rest are working on scheduling. I will be sending my notes to the board of directors and summaries to the board of advisors and the Foundation List. As a side note, several of the advisors will be having others from their company represent them at the advisory board meeting at GUADEC. At least two will try to attend by phone – hopefully that will work better this year. (Many of them are not happy with this year’s GUADEC location because it is expensive and inconvenient to get to and because of the expense and the perceived vacation-location, it’s hard to ask for travel approval. Although I think the time it takes to get there was the real impediment for the ones not able to make it.) When this year’s bids for hosting GUADEC come in, I’ll be sure to alert the advisory board that it’s time to give input. Karen Sandler will represent the SFLC (our attorneys) and she’ll hold a legal BOF if anyone in the community has questions for her. Voted in the GNOME Foundation directors election. Only 5% of those that donated money are GNOME Foundation members and less than 20% are GNOME contributors. Several mentioned in the comments that they give money because they don’t have time/skills to give code. The “what would you like to see” question is a ranking one but it looks like at least half of all respondents ranked “exactly what you are doing now” and “usability studies” in the top half. Of the 230 people that answered the gender question, only one was a woman. Someone suggested the survey was a good idea and we should do it regularly. Someone suggested pinging people if they have donated in the past but not in the past year. There were some great comments in the free form fields. Did a few other logistical things for the Desktop Summit like remind all of the sponsors who qualify for displaying banners that they can bring banners, bugged travel agency about meeting room for advisory board (and Chema called them for me), sent a bunch of invitation letters to GNOME folks for visa purposes, gave quick input on several issues, etc. Reviewed accessibility contract and Willie Walker now has it to use as appropriate to contract with people to do GNOME accessibility work. He’s already drafted the first statement of work and is working on getting everything signed in a way that makes our attorney happy. GNOME Board Meeting was cancelled/postponed as we didn’t have any issues to discuss. Out June 13th-June 23rd visiting my parents and setting up a Kids on Computers lab in Huajuapan de Leon. Meet with the remaining advisors that I haven’t met with. Finalize agenda for advisory board meeting at GUADEC. Work on 2009 finances with nonprofit workshop and Jaap’s feedback in mind. Work with marketing list to figure out how best to report and act on Friends of GNOME survey data. Went to the Open Source Systems Conference. This was a very different academic group than TOS and HFOSS. Instead of professors using open source in their undergraduate curriculum, it was mostly professors and PhD students who are studying open source software projects. Not necessarily participating in them or teaching people how to participate but studying how they work, like this study of GIMP. There were quite a few people that had studied GNOME but several people mentioned that it is a hard project to study because it has so many subprojects. (I don’t think that’s a problem, except to researchers.) During my keynote people asked a lot about how GNOME works and several people asked how they could help from a research perspective. I said anything that told us more about our users! I also encouraged them all to blog – I said bits of information often would be more useful to the community than one research paper at the end. Went all the way to Sweden and didn’t see Andreas Nilsson, Kalle Persson nor my high school friend that lives there. Had a train ride and dinner with Rishab Aiyer Ghosh. I asked him how he would get GNOME more involved with governments and his advice was to start in Spain where the government is already heavily involved with open source and GNOME has strong ties. Wrote press release for the keynote speakers at the Desktop Summit. (No immediate feedback from the Desktop Summit mailing list.) The platinum sponsor press release came back approved from the sponsoring company too. We need to schedule these this week. Sent out Friends of GNOME survey to learn more about who our donors are, why they support the GNOME Foundation and what they’d like to see the Foundation do. Need to go through the data this week. Put together Friends of GNOME May data and blog post. (Thanks to Jaap A. Haitsma for improving the spreadsheet and correcting the errors in the monthly calculations.) We’re doing really well on our annual goal ($16,000 of $20,000!) 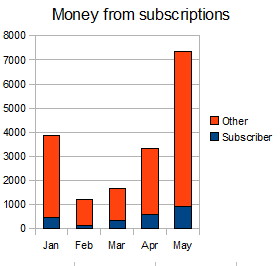 but I’d like to see much more of it from subscriptions as we can count on those monthly and make plans accordingly. Pinged Desktop Summit sponsors about logos and company descriptions for the USB drives. Participated in the “What do you expect from the Foundation” thread on the GNOME Foundation mailing list plus several off thread conversations. Took over writing some of the invitation letters for the Desktop Summit from Agustin for people that need visas. Sent our attorney’s feedback on our 401K plan to the 401K plan provider, SocialK. Schedule press releases for the Desktop Summit. Review accessibility contract that attorney reviewed/rewrote. Get and analyze data from Friends of GNOME survey. Vote in the GNOME Foundation Directors election! Thanks very much to Jaap A. Haitsma for improving the spreadsheet and correcting the errors in the monthly calculations. Monday was a US holiday. Went fishing and to a barbeque. Talked to our attorney about 4 outstanding issues. Told him to hold off on SugarCRM until we decide we are ready to use it. Verified that hackerthreads agreement didn’t sound like it prevented us from creating our own store. He will also get 401k agreement reviewed and look over the accessibility contract. Dave Neary suggested putting out a notice of action when the board investigates something. Board agreed. Dave Neary suggested making the gnucash file public. Board agreed but we need to figure out automated way to scrub donor data. Talked to a representative from a sponsor company that is way behind on payments and he thinks he can pay it all next month! Yeah! Pinged a sponsor about some additional money they’ve agreed to give. Pinged community members signing Canonical agreement to do some of the bugzilla upgrade work. Talked to a non-sponsor company, but one that is active in our community, about helping out with a usability study. Tested Friends of GNOME survey with the marketing list. Corrected all typos and design issues. Put together the list of email addresses from all donors in the past 12 months. Launching next week. Continued sponsorship discussion on marketing mailing list. We’ve been talking about different levels of sponsorship, different levels for different size companies and different packages of benefits for different amounts of money. Not much response to my initial list of benefits that we could package up. Prepared talk for keynote at Open Source Systems conference next week. See my blog post. Wrote draft of Google Adwords Grant application and sent to marketing mailing list – didn’t get any feedback until I said I was submitting. Discussion happening now. Applied for scholarship, i.e. sponsored travel, to attend the Grace Hopper conference, a very cool women in computing conference. I’ve been invited to be on a panel. 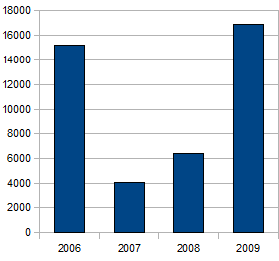 Wanted to work on 2009 finances with nonprofit workshop in mind but didn’t get to it. Get remaining Desktop Summit invoiced and their logos in the program. Put out a press release on the Desktop Summit keynote speakers. Send out survey to Friends of GNOME. Put together Friends of GNOME May data and blog post.